Last season, Liverpool displayed a style of play that was both vibrant and packed with character. As the 2018/19 Premier League season draws ever closer, it seems only right that their new football kits should reflect such energy and flair. The front three of Mo Salah, Sadio Mane and Roberto Firmino proved absolutely deadly last year, as the Reds secured another top four finish and marched all the way to the Champions League Final. Liverpool’s sheer pace and attacking intent have been lauded by fans and pundits alike, with Jurgen Klopp taking the plaudits for their exciting, almost breathless, pressing football. So, does the 2018/19 Liverpool away kit match up to this exuberant style? New Balance have unleashed the 2018/19 Liverpool kits surprisingly early this summer, with the home strip revealed a good few weeks ago. This design stayed true to the ‘Red Pepper’ colourway of last season, while subtle detailing paid homage to parts of Anfield and the victims of the Hillsborough Disaster. While the rest of the world continues to suffer from a serious case of ‘World Cup fever’, the American manufacturers have gone ahead and unleashed the brand-new Liverpool away kit. And it’s a thing of sheer beauty. The bold plum colourway is just about as vibrant as they come, while the jacquard linear graphic on the front fits with the design of the new home shirt. This violet theme is continued on the shorts and socks, too, as Liverpool look set to show off a football kit that reflects their confident style of play. Colourful orange detailing on the logos and collar provides a nod to the Liverpool third kit of last season, while a slightly darker plum shade on the sleeves adds a lovely contrast to the rest of the shirt. 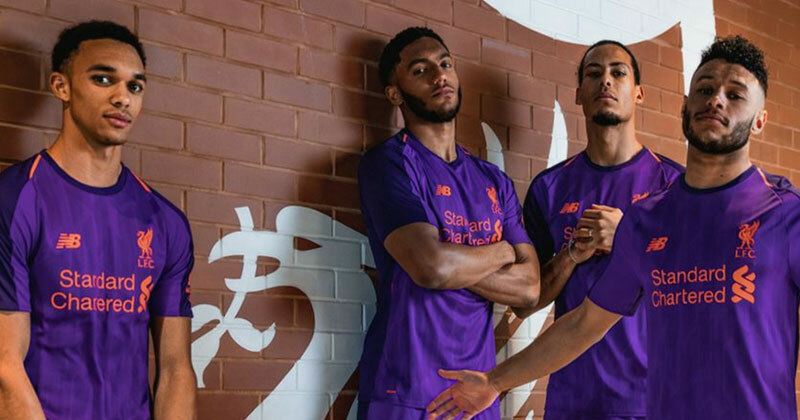 This is the first time a Liverpool football kit has featured these shades of purple since the 2012/13 season, when the colours featured on their third kit in what was largely a disappointing Premier League campaign for the Reds. But Klopp and his men will be hoping for better luck this time around- which they’re likely to get, if they can keep hold of their front three this summer. Liverpool kick off the new season at Anfield on 11th August, where they face West Ham on the Premier League’s opening weekend. We can’t wait to see the likes of Salah, Mane and Trent Alexander-Arnold showing off the new Liverpool football kits, and only time will tell if their pressing tactics will prove so effective this season, too. Whether you’re a Liverpool fan or not, you can find cheap Premier League football kits right here with FOOTY.COM. We compare prices to help you find the biggest bargains on the internet, so that you can gear up for the new season with a bit of extra change left in your pocket!